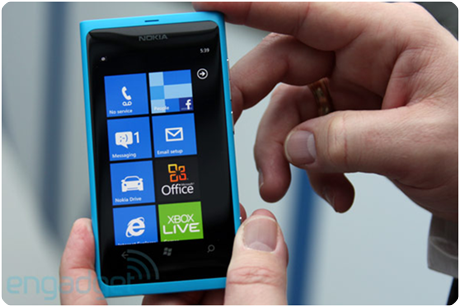 Microsoft and Nokia launched the first ever real Windows Phone. The new phone OS is clearly identified with its familiar tiles-based Microsoft’s user interface and Internet Explorer 9 browser. As expected, Nokia added some functionality for multitasking for apps and promised a fast social network access, deeper integration of Facebook and Twitter. Currently there are 30,000 apps, and expected to increase 10 times next year. The 2 Windows Phone will be available in some European countries in November, including France, Germany, Italy, Netherlands, Spain and Britain. And before the year-end, it will be shipped in Hong Kong, India, Russia, Singapore and Taiwan. Nokia’s Lumia 800, priced at some euro 420 ($580), and Lumia 710 at euro 270. The camera lens seems to be fine with 8 MP but I am not satisfied with it’s 512 MB memory. For sure this will be compared to different Android Phone and iPhone, So we will update our readers in future about their comparison results. This phone might be available in Philippines by the end of this year but it is not yet official. Probably this will be in a range of 25,000 to 30,000 but who know it might be lower, it is just my guest.